I found this soup at Whole Foods Market, and really liked it. The label, “Butternut Possole” (can you believe they misspelled it? 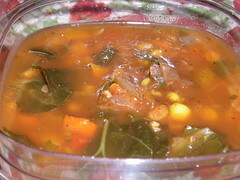 ), caught my eye, as I love posole, which to me is any stew-like dish made with hominy. I don’t normally buy their soups because they are as salty as Campbell’s, but this one, I noticed had only 33mg per serving – amazing! It is part of a new line, a worker told me, with a little Health Starts Here logo on the label, denoting healthier versions. That seems a little ironic to me, in a store that is supposed to pride itself on healthfulness in the first place, but so be it. This soup was also fat free. But it didn’t actually have posole in it! It had regular kernel corn, along with zucchini, butternut squash, and collard greens, and plenty of good seasonings like ancho chile powder and lime juice, though, so it was delicious. But now I’ve got to make some real posole. My green chile stew (similar to the link) with hominy and Cherry Grove Farm pork is bubbling away on my stove as I type.